This week, we're checking out another lunchmeat product: Tofurky Hickory Smoked Deli Slices. I had tested out the oven roasted variety before, and was a little disappointed at the lack of flavor, but was hopeful that the actual flavored varieties might work better. Let's take a look. 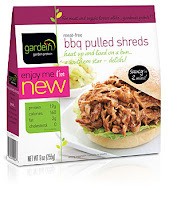 As before, they bragged about their thin slices, but I keep forgetting that whenever I go to the package. I see what looks like nice, thick slices, and I pull one out, only to discover that it's two slices stuck together. And then, since I'm generally not excited by paper-thin slices of meat (or meat analogues), I went ahead and used the two slices still stuck together. Take that, thin-slice mafia! Once again, I went the crackers and cheese route, since that's the way I do things at my house. But first, I sampled a bite of deli slice on its own. Gotta say, not great. Same off-flavor as the last deli slice product. But, it seemed a little bit less prominent, as the slice had a more smoked-turkey-ish flavor. So I loaded up some crackers with Swiss cheese and some fake meat turkey slices. Once I had everything all together, and I don't say this often, it actually tasted just like real lunchmeat turkey. The powerful Swiss flavor overwhelmed the off-flavor, but the hickory-smoked flavor stuck around. I assume this was also due to the fact that I had a double layer of the deli slice - not sure if a single super-thin slice would have stood up to the cheese. 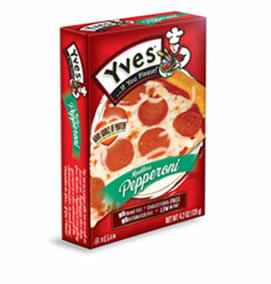 Honestly, this was very tasty, and I've eaten it again since testing out this product. 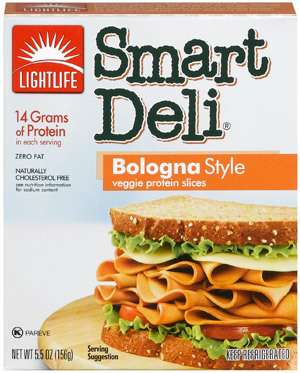 Once I'm done trying out all the other flavors of deli slices that Tofurky has to offer, I just might end up buying this on a more regular basis. Texture - Standard lunchmeat texture - nothing much else to say about that. Flavor - Not great alone, but when combined with other ingredients, it actually tasted just like turkey lunchmeat. Meatless meatball party, part 4 - the finale! 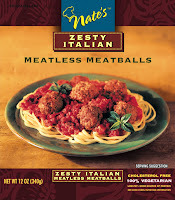 It's the final week of meatless meatball reviews! 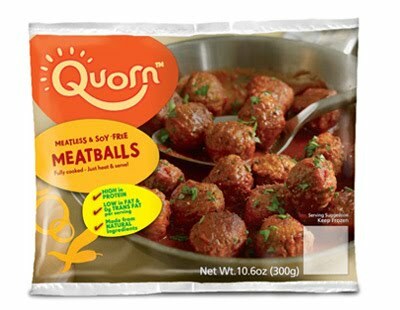 Let's see how Quorn's Meatless Meatballs stack up. Also in this review, as promised, be sure to check out my Swedish meatball sauce recipe. It's super delicious, and I invented it myself! On their website, Quorn brags that their meatballs are, "so flavorful and succulent that your meat-eating friends and family will not be able to tell the difference." This is the first Quorn product I've tried that isn't trying to be poultry… let's see how they do with beef! Same routine for preparing them. Put them on a tray in the oven at 375 degrees for 10-ish minutes. (not precisely what the package says to do with them, but the idea is just to get them hot, which I accomplished) The first thing I have to say about these, is that they looked… not very meatball-like. Let's see… how can I put this delicately? Eh - I'll just say it - they looked like frozen dog poop. I mean, look at that picture! Would you want to put that in your mouth? Maybe if you cooked them in a sauce, they'd look more appetizing. But there you go. It is what it is. April: Bit dry, good texture. Dan: Poopy [I'm assuming he was describing the appearance], very nice texture, good seasoning taste. Ginny: Most meatball-like; appearance: sunburned marshmallows. Springy; best with Swedish and BBQ; taste B+. Tastes better than it looks. Anonymous: Good consistency and texture, best all around. I have to say, I was pleasantly surprised by these. They did have a very nice texture. They were definitely the most meat-like of anything else we ate that night, but I can't say for sure that I wouldn't be able to tell the difference between these and meat. By the time the night was over, I don't think I knew what meat was supposed to taste like anymore. So many different versions of meatless meatballs! I'd like to do a head-to-head at some point - perhaps a blind taste test? As far as sauces go, these were very good with both the BBQ sauce and the Swedish sauce, as Ginny said, but I didn't like it with the marinara. We'll stick with the Nate's meatballs for that one. Flavor - Not much of a flavor to speak of on its own, but meatballs aren't usually eaten on their own, so that's okay. First up, gather and measure out all your ingredients before you start - some of this goes pretty quickly, and you don't want to be scrambling for ingredients at the last second. In a 2-qt saucepan over medium to medium-high heat, melt the butter, then stir in the flour. Use a whisk to combine them thoroughly, and use a rubber spatula to make sure none of the roux (that's cooked flour + butter, is pronounced "roo", and is used to thicken your forthcoming sauce) gets stuck along the edge of the bottom of the pan. Let it cook for just a minute or two, stirring either with the whisk or spatula, your call, to cook out the starchy taste a little. You don't want to brown it, since this is a white sauce. Next up, pour in your wine. If you have objections to using wine, you can substitute 1/4 cup vegetable stock. This will bubble like crazy - just keep whisking! It'll get really thick really fast, sort of like a pudding-consistency. This is right. Don't worry. As soon as it's all combined, whisk in your vegetable stock. It'll go back to being soupy and maybe lumpy - just keep whisking. As soon as the temperature approaches a boil again, it'll thicken up. Once it's nicely thickened, you can add in your salt, pepper, and dill, and leave it alone to bubble away over very low heat until you get close to needing it. It'll thicken up more as it simmers, so keep an eye on it, stirring occasionally. It's okay if it gets a little thicker than you were planning, because you're still going to add the sour cream. I wouldn't leave it simmering for more than 20-30 minutes - if you need that long, definitely put a lid on it (that will slow down evaporation), and/or pull it off the heat until closer to the time when you need it. As long as we're not talking hours, it'll still be safe. A couple minutes before you're ready for it, stir in the sour cream. I have a range there, because some people might want more, some people might want less. Start with a half cup and taste it, adding more if you'd like. Only heat it until the sour cream is hot - do not let the sour cream boil! It will curdle and look unpleasant. It'll still taste okay, but it won't be as pretty. Finally, re-season with salt and pepper if it needs it, and serve! If you're going to prepare this ahead of time, that works just fine - just prepare as written, and then refrigerate. It'll keep for a good week or two - just reheat it when you need it! Continuing meatless meatball month, we're on week three with another homemade meatless meatball. This week, we're testing out a recipe from this website. This is a lentil-ricotta meatless meatball. The creator of this recipe actually states: "It looks like a meatball…smells like a meatball…[and] most importantly, it tastes like a meatball." The pictures on the website definitely look like meatballs, so I figured I'd give it a shot. First problem I had with the recipe - it just calls for lentils. I have never used lentils, so I did some research on what sorts of lentils were out there, and tried to figure out which one would be best to use. Since they were going to be pureed, I went with a red lentil, which I learned does not hold its shape well when cooked - I figured I'd just save myself some time and use an already-squishy lentil. This was a mistake, which I'll get to in a second. Side note, after printing out the recipe, I did not go back and look at the pictures until I was done cooking them, so I had no idea how wrong I was. The rest of the ingredients were pretty straightforward. I cooked up my bright salmon-colored lentils, and then drained them, where I lost a bit of the mushy-lentil goo through the strainer. I couldn't leave it in the strainer too long, or it would have oozed out completely, I suspect, so I just got as much water out as I could, then dumped them into a bowl and finished mashing up the ones that hadn't yet disintegrated (not many). This, right here, I believe is the source of all the future problems I had with this recipe. Too much water, and too-mushy lentils. I forged ahead anyway (again - I hadn't looked at the pictures on the website in a day or two), adding the remaining ingredients. I tasted it, for seasoning purposes. This definitely did not taste anything like a meatball, but it tasted fairly good, so I decided not to abandon the project. I popped it in the fridge for the required two hours, hoping it would firm up a bit during that time. When it came time to cook them, I got my pan of oil ready to go, then pulled the bowl of lentil-ricotta goo out of the fridge. It had firmed up slightly, but not nearly enough. Maybe with more time… In any case, I scooped spoonfuls of the goo into the pan of hot oil, and watched them totally flatten out. Again, looking at the pictures on the website now, that was very wrong. But it was way too late to do anything about it, so I continued. They browned nicely on the bottom, but then I had to flip them. They were really soft, which made them very difficult to flip. Probably also a result of too much moisture. I did my best, only ruining two or three in the process. That was okay, since, even though the recipe said it made 18, my batch made close to 30. I finished cooking up the lentil balls, and then froze them. 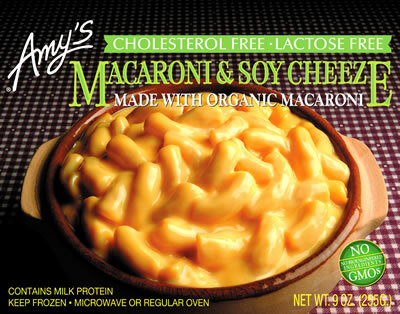 Dan: Cheesy, almost gritty, no real flavor, has potential. Ginny: Delicious taste on own. Texture kinda mashed-potato-y with crunchy outside. Best on own - no sauce. Or Swedish. A little grainy. Anonymous: Preferred potato pancake-like appearance. Dry, tastes of milled grain product. I definitely agree that it had a mashed potato consistency on the inside. The exterior was nicely crispy. Texture-wise, this was pretty enjoyable, but nothing like a meat-filled meatball. Not even close. 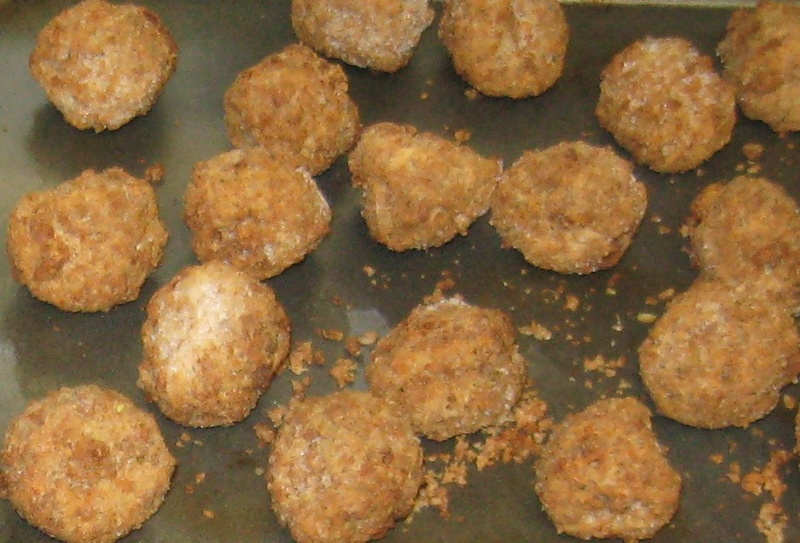 If I'd coated it in breadcrumbs before frying it, I could probably sneak it past someone by calling it a croquette. Which would be delicious. But we were going for a meatball experience here. And it tasted like lentils! Which wasn't bad, but it sure wasn't meat. And before anyone jumps down my throat, allow me to specify: it tasted like red lentils! Maybe whatever sort of lentils the original recipe poster used tasted more meaty. I'll have to try it again with different lentils and see if it's more meat-like. I'll get back to you on that. Texture - Crunchy outside, mashed-potato-y inside. Neither of those things are like a meatball. Flavor - Lentil-y and cheesy. Neither of those things are like a meatball, either. While these were tasty, I was promised a realistic meatball experience with no meat, so I had to give it a lower grade than I would have otherwise. But I'll try it again with different lentils and reassess. Add all ingredients to a deep bowl. Mix very well, using hands or a wooden spoon. Cover and refrigerate for two hours or overnight. 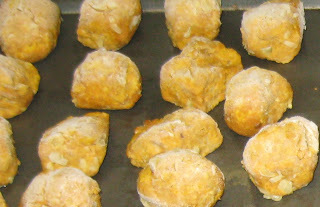 When ready to cook, shape mixture into 1 1/2-inch balls. Heat about 1/2-inch of oil in a nonstick skillet over medium flame. 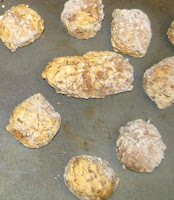 Add shaped "meatballs" and cook until browned all around, turning only once. Transfer to a paper towel-lined plate and let excess drain off. Add to simmering marinara sauce if serving immediately, or store in a tightly covered container up to three days. Welcome to part two of the month of meatless meatballs! 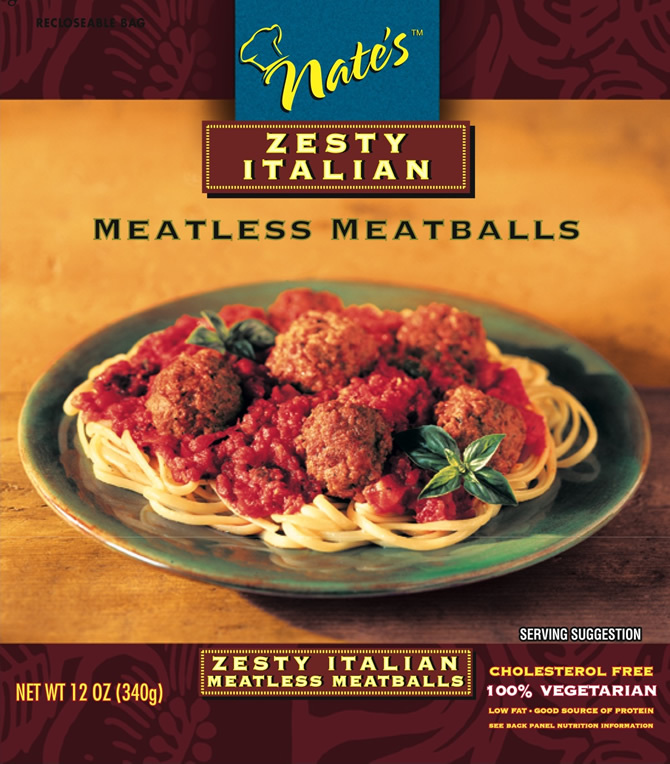 This week, I'm reviewing one of the frozen products: Nate's Zesty Italian Meatless Meatballs. This is also where I shall reveal my secret recipe for amazing marinara sauce! Start getting excited now, people… it's really a great sauce. But first, the review! Let's take a look at what the bag promised: "incredibly delicious flavor and a texture that rivals traditional meatballs", "try with pasta, stroganoff, Swedish meatball dishes, or goulash", "wholesome addition to gravies, tomato sauces, pesto, and sweet and sour sauces". Wow - this sounds like a great, all-purpose meatball. I had done a preliminary internet search for other people's opinions of these - overwhelmingly positive. 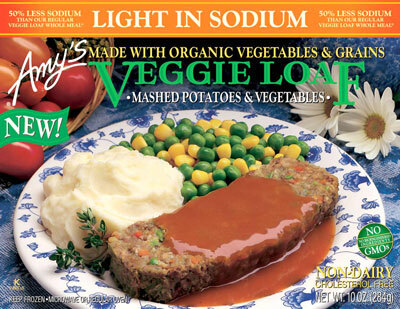 But then again, the internet is full of mostly-positive reviews of fake meat. That's what I'm here for! I'll tell you - right out of the bag, these looked very meatball-ish. I was pretty excited to cook them up and give them a taste. Again, I put them on a tray in the oven, un-sauced, at 375 degrees for about 10 minutes. April: Nice and crispy, poor flavor. Dan: Nice crispness, but poor texture otherwise, flavor is weak. Ginny: Crunchy, crusty outside - seems pretty bread-dough-like inside, texture-wise. Best with BBQ. Doesn't taste much like meat but pretty inoffensive taste. Anonymous: Dry and crunchy, but good meatesque flavor. Like chewing meat hay. Most authentic appearance. I thought the exterior was awesome - super crispy. The inside was definitely mushy, though. It was also very fragile - it didn't take much pressure to cause it to fall apart. One of the cooking directions suggested heating up the meatballs in the pot of sauce. I think this is a terrible idea. It would eliminate my favorite part of these (the crispy outside) and, I suspect, turn them into a big pot of mush mixed with sauce. It didn't have too much flavor on its own, which is why the package was able to suggest so many sauce possibilities - it's not going to fight with anything, so put whatever you want on it! I thought it tasted pretty great with the marinara sauce, only ok with the barbecue sauce, and it didn't really work with the Swedish meatball sauce. Possibly the Swedish sauce didn't have enough oomph to improve the meatless meatball. But again, great with the marinara, which is why I'm pairing this review with that recipe. Just combine all the ingredients into a pot big enough to hold them all (I usually use my 2-quart saucepan, just to give it some room to bubble. Put it over low heat and bring to a simmer, stirring occasionally. Let it simmer long enough for the flavors to meld, which should take at least 20 minutes, and then keep it over very low heat until the rest of your food is ready. If you're going to serve it with pasta, start the sauce first, then put your pot of water on for the pasta while the sauce is simmering. This sauce also freezes well, so feel free to make a huge pot of it, and freeze the sauce in plastic bags (or whatever you'd like to freeze the sauce in) in serving-size quantities, then thaw as needed later. So simple, yet so tasty! You can also use fresh herbs, if that's your thing, but I find that dried is easier. You can also dice up some onion and saute that in a little bit of olive oil in the saucepan before adding the tomatoes, if you like onions. Really, this is just a basic starting point. Go crazy with it! I started writing this blog nearly a year ago (first review posted August 24th, 2009), and I wanted to do something special to celebrate. So, welcome to the first installment of a four-part series of meatless meatballs! I got some friends together a few weeks ago, made them all eat a bunch of fake meat meatballs, and then take notes for me. So, not only will you get a bunch of meatball reviews, including two homemade meatballs (yes, you'll get the recipes! ), I'm throwing in a couple meatball sauce recipes, and you'll get to hear opinions from people other than just me for once! I still get final word, though. It is my blog, after all. April: My lovely wife, of course. She'll also be occasionally posting on here as my resident statistician, so be on the lookout for that. Dan: My best friend from way back when he invited himself to my wedding in 2005. Not a vegetarian, but sometimes eats fake meat just for fun. Ginny: One of my awesome pescetarian friends who inspired this project. She hasn't yet lost touch with the meat-eating experience, so I trust her judgment as far as whether things taste "like meat" or not. Anonymous: Yes - one of my friends refused to let me use his name. I'm going to assume that it won't compromise his anonymity too much for me to say that he is also a pescetarian. If he would like to add anything to this, he can feel free to comment (or otherwise contact me) with whatever else he feels might be relevant here. Alright, let's get to it! First installment is going to be a homemade meatless meatball. I got the recipe from this page. It's called Meatless BBQ Balls, but I did it a little differently, to suit my purposes. 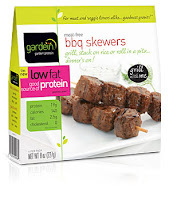 Disclaimer: the original recipe poster said that these do not taste like meat, and that wasn't her plan, but that "they are savory and rich and would make a good 'meat' part of a meal." I guess I should explain my meatless meatball tasting party format. I cooked up four different types of meatless meatballs, and also prepared three different dipping sauces, just to get a full range of experiences. The three sauces I made were a basic marinara sauce, a homemade barbecue sauce, and a Swedish meatball sauce. I am not at liberty to share the barbecue sauce recipe, but I can definitely share the other two. Because I had three different sauces to test out, I cooked these balls with no sauce. Since I modified the recipe a little bit, I included my version below. Something else that might be important to know is that I prepared these a few days ahead of time and then froze them after the first 20 minutes of baking time. I figured it wouldn't be terribly fair to serve two frozen meatballs alongside two freshly cooked meatballs, so I froze the two homemade meatballs to even the playing field, and also to make the meatball party run a bit smoother, with fewer stuff for me to put together last-minute. This meatless meatball was pretty easy to put together. I didn't really run into any problems while preparing them, which is a little unusual for me. The… dough, I guess? had a really nice easy-to-work-with consistency that I think most people would be able to duplicate. I was really hoping they'd taste good, too. I wrapped them up in the foil, accidentally deforming some of them in the process, and put them in the oven. Twenty minutes later, I pulled them out, carefully extracted them from the foil, and froze them. April: Mushy and gluten-y with a wheaty flavor. Tastes like stuffing. Dan: Very bready. Tastes very pleasing. Ginny: Bready. Stuffing-y in taste and texture. Best with Swedish sauce, pretty good with marinara. Anonymous: Texture of stuffing. Tasty stuffing. Best with Swedish meatball sauce, which is like gravy. My own impressions were pretty similar, at least texture-wise. They were definitely mushy. I wonder if they maybe didn't get cooked enough in the foil versus the parchment that the recipe originally called for (but is just stupid-expensive and I don't keep around). The principle is still the same - it's basically steaming the balls, whether using foil or parchment, so I'm assuming it just needed more time. But maybe they would have been mushy anyway. Hard to say. I didn't think of a stuffing flavor until everyone else said it - it mostly tasted like onion to me, which is not a bad thing. I do agree, though, that the Swedish meatball sauce was the best, with the barbecue being also fairly good. I thought the marinara was a bad combo, though. Just didn't work for me. All in all, these were definitely not meat-like, but they weren't supposed to be, so they shouldn't be punished for that. On their own merits, these were a little tough to eat, being so mushy, but not unpleasantly flavored. Preheat oven to 375 degrees. Prepare two fairly large pieces of aluminum foil. Mix all ingredients in a bowl--the mixture will be very thick. Shape into 18 balls and place half of them on each piece of the foil. Fold edges of foil tightly to seal in the balls. Bake for 20 minutes or until golden brown. Unwrap and coat in sauce (if using) and allow to bake uncovered for 8 minutes. Add additional sauce if you think it needs more after you bake it a bit longer, and serve hot. A few months back, I did this review, for Trader Joe's Chicken-less Chicken Strips. These were incredibly gross. 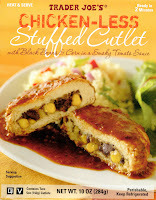 Jason commented about a stuffed cutlet product that is made from the same stuff. He describes them as, "a violation, abomination, and unnecessary disruption to an otherwise pleasant day". With such high praise, how could I pass them up? I'm nothing if not thorough. Before I get into my own experience, we need to explore the other end of the hyperbolic spectrum. Let's hear what the product packaging has to say about this item. 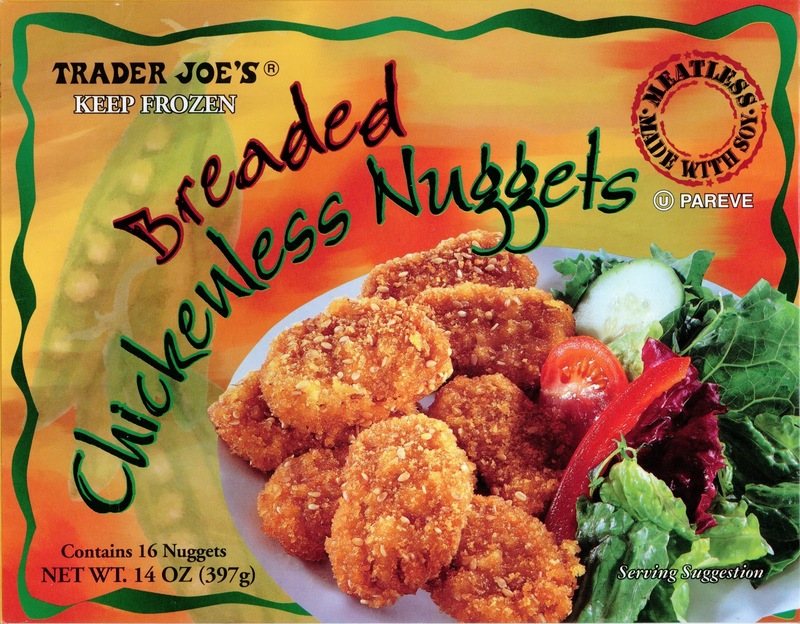 Trader Joe's Chicken-less Stuffed Cutlets feature the same great tasting "chicken-less" chicken found in our Chicken-less Strips. They're stuffed with black beans, corn and jalapeño peppers in a spicy (but not too spicy) tomato sauce. A little rice, maybe a salad… dinner's on the table in less then five minutes! Ooh… that's all they have to say about it? Usually you can count on the package to really hype up the product. They can't even get excited about building a meal out of it. Such ambivalence. So with terror in my heart, I busted this package open. This is some weird stuff. Two meat-ish blobs, and two pockets of sauce, all separated and vacuum sealed. The directions indicated that the microwave was the best option for preparing these, and who am I to argue? If I'm going to have to put these in my mouth, I guess I'd better give them the best possible chance, thus hopefully avoiding some random commenter telling me I did it wrong and that's why it tasted so gross. I followed the directions exactly. No way would I have to redo this one. Okay… "pierce bag" - even the sauce? Won't that result in sauce pouring out all over the place? Better put it on a plate. Oh - "place bag on dish" - they're way ahead of me. "Heat on high 2 minutes". Okay - done. Now I have four super-hot steamy pouches. 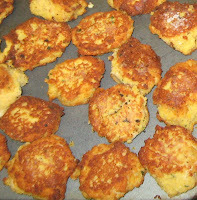 (I was planning on torturing my wife with this as well, so I prepared both cutlets in one go.) I removed the first cutlet from the packaging as well as I could, spilling some unidentified juice from the pouch all over the plate in the process. The tomato sauce did, in fact, ooze out all over the plate, so I scraped that up and smeared it on top of the cutlet. This did not look anything like the picture on the front of the box. I considered taking a picture, but decided against it. You're welcome. Then, before preparing the second cutlet, I decided to give it a taste. If it was completely inedible, I'd save myself the effort. I cut into it with a fork, which took considerably more effort than I was expecting. This chicken-less chicken was TOUGH! Super springy, if that makes sense. I succeeded, eventually, in carving off a bite, and popped it into my mouth. The texture made more sense to my teeth than it did to my fork, but it still wasn't great. You could maybe replicate that texture if you had some really tough, overcooked chicken, but I don't think I've ever messed up chicken that badly. The flavor, however, was very similar to how I remember the Chicken-less Chicken Strips. In other words - totally gross. However, I didn't get much filling or sauce with that first bite. So, I went in again. I prepared a forkful with a bunch of filling and a bunch of sauce (which, by the way, tasted very good on its own), and reluctantly put it in my mouth. 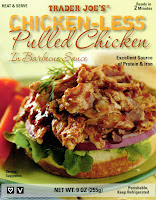 Much to my surprise, with enough other stuff, the flavor of the chicken-less chicken was mostly muted. Not gone, but muted. However, there was not enough filling or sauce to maintain that ratio all the way through the cutlet. While picking at the rest of my (mercifully tiny) cutlet, I tried the filling on its own, just to see what it was like. Unfortunately, it had absorbed too much of the chicken-less chicken flavor to be good alone. Plus, the beans in it were super mushy, the corn was flavorless, and I couldn't taste the alleged jalapeños, which was fine with me. The sauce was great. I wouldn't call it a spicy sauce, though, even with my very weak spice tolerance. Sorry, Trader Joe's - that's another lackluster performance with your name on it. Try again! Flavor - cutlet - ew; filling - blah and ew; sauce - delicious! And yes, I did make my wife eat her cutlet. Because I didn't finish mine, I gave her all my extra sauce. I'm such a good wife! Things are starting to get weird now. Brace yourselves. 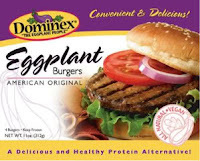 This week, I'm reviewing a new veggie burger: Dominex Eggplant Burger. 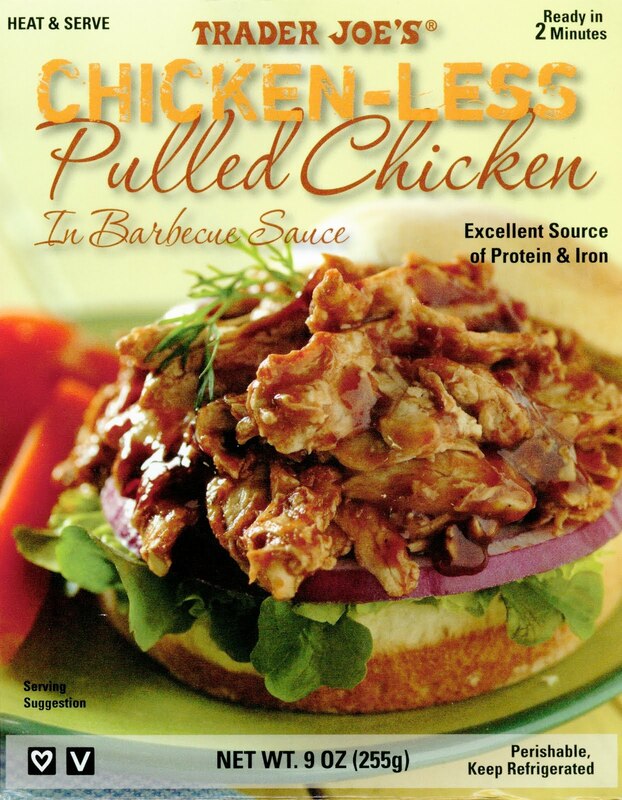 They claim to be "a healthy alternative to both conventional and meatless burgers". I'm not a big eggplant eater, but hey - antioxidants and low-fat/high-fiber things are good, right? First thing I noticed were the painted-on grill marks. Man - these crack me up. I'm not sure why, but they do. The stove-top directions said to cook the burgers in a skillet with a little oil for 8-10 minutes, flipping occasionally. No way would these have been edible if I'd cooked them that long. I actually timed it, this time, and I cooked it for precisely four minutes, at which point it was definitely hot. If I'd continued cooking it for another four to six minutes, it would have been totally charred. So be aware - these will not take as long as the box says. I still had some onion buns left over from the Sunshine Burgers experiment, so I toasted one up. Sooner than expected, the burger was done, and I put it all together. Like before, I tasted a bit of the burger alone before eating it with my awesome onion bun, just to get an idea. It actually tasted pretty good. One of the ingredients (which cracks me up about as much as the painted-on grill marks) is "natural grill flavor". If you're curious, this consists of maltodextrin and flavor from vegetable oil, whatever that means. I think this flavor contributed to the initial deliciousness. It had kind of a smokiness that I liked. So I sat down to devour the rest of the burger. As I got further in, each bite had more and more of a strange off-flavor. I don't know how to describe it other than by saying it had a sort of sharpness to it. Mildly unpleasant, but not overwhelmingly so. Maybe that flavor came from the seeds and skins they brag so much about having in their burgers. In any case, the odd flavor didn't stop me from eating the rest of my burger, but once they're gone, I probably won't pick these up again. There are other veggie burgers that I liked a lot more, and that I don't have to make a special trip to a co-op to find. If you really like eggplant, though, you might want to give these a try. Sorry for no fake meat review again today, everybody. I tested out something new this week, but am unable to write about it as my brain is in the process of exploding. We just found out yesterday that we're going to be hosting a foreign exchange student from Japan this upcoming school year. For most people, this isn't such a sudden surprise, but we only applied last Saturday, so things are moving pretty quickly. It's possible that I'll write up something later today, but more likely that I'll just skip this week. But I've got something big in the works. It's been almost a year (!) since I started this thing, and I'm doing a special series for the entire month of August to celebrate. There will be recipes! And pictures! Stay tuned! 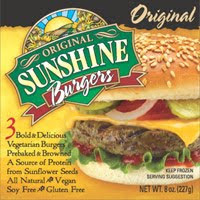 We're heading deep into hippie territory this week with the Original Sunshine Burger. The ingredient list on these is ridiculous: brown rice, sunflower seeds, carrots, herbs, and sea salt. That's it. Also, according to the packaging, these burgers are not intended to be a beef imitation, but instead an "excellent flavor sensation of their own." Let's see if they can live up to the hype. To prepare to receive this flavor sensation, I made some fresh burger buns. I used the King Arthur Flour recipe for Onion Buns, because I saw it a while back and recognized this as a golden opportunity to try them out. They came out looking gorgeous, and my whole house, in addition to the awesome freshly-baked bread aroma, smelled like onion, which is a plus. More on how they tasted later. Once dinner time rolled around, I tossed the burgers into a skillet. These come three to a package, so I just cooked up all three. The box said "no oil needed" but after they thawed out, they started sticking pretty badly to my pan, so I put a little oil in there, just to keep them from being completely destroyed. As they approached the "desired warmness" (yes - the box says that - "All our burgers are fully precooked. Please do not overcook, just heat to desired warmness. "), they started to become very fragile. Two of them broke in half when I tried to flip them. That was a little frustrating. Eventually, we got the three patties on some onion buns. I tried a piece of burger plain, first, to make sure the bun didn't artificially inflate the grade. It was… okay. A little dry, a little crumbly, and tasted very much of sunflower seeds. Pretty much only sunflower seeds. That was probably the "sun" part of Sunshine Burger. They might as well have called it Sunflower Burgers. It wasn't bad, if you like sunflower seeds. But it wasn't exciting either. Then I tried it on the bun. Way better now - the onion flavor matched the sunflower seed flavor pretty well. Still dry though. I added a slice of cheese (Velveeta singles… don't hate me! They have superior meltability!) Now I had something… The gumminess of the cheese helped hold the burger together, keeping it from being too crumbly in my mouth. But it still needed a little something. I squirted on some ketchup. And then some more, as the awesome bun absorbed it all, and I couldn't actually taste it. Finally, I had something that I could consider dinner. Flavor - Imagine a mouthful of sunflower seeds - yep - that's about it. Before I get started on this review, I need to explain whatever crazy stuff I may end up writing. I started a new job last week in a bakery. Bakeries have weird hours. I get to work at three o'clock in the morning and stay there until eleven o'clock in the morning. Then I come home and try to nap. I got home from work a little early today, haven't gotten my nap yet, and thus am writing this post in a strange mental state. I apologize if anything seems too weird… Just bear with me while I'm adjusting to my new schedule. Okay, now to the good stuff. This week, I'm reviewing Tofurky Oven Roasted Deli Slices. That link is as precise as the Tofurky website gets. Gotta say, I'm kind of excited to someday try out the "Philly-Style" Steak Deli Slices. Not a lot of steak-imitators out there. And I'm always up for some "'Philly-Style' cheese-steak fun"! Does anyone know what stores carry it? I don't think I've seen it any of the places I go. Anyway… time to focus. Something weird about me is that I'm not that into sandwiches as a food-delivery method. I don't know what it is about them - I just can't get that excited about a sandwich. (unless it's a grilled cheese sandwich - that's a whole other category) So what I usually do with lunchmeats is put them on crackers with cheese, a la Lunchables. My favorite cracker to do this with is Triscuits because they only have three (3!) ingredients, and that makes me feel good about myself. * So, since that's what I typically like to do, that's how I decided to test out these deli slices. I got my crackers and cheese ready to go, and started trying to peel apart the slices. It's been a little while since I last saw the package, but if I remember right, they made a big deal about having thinner slices, and more of them! This tells me that the package size is the same as it used to be, it's just more work for me to separate the slices, and they can probably charge more than they used to. I'm so jaded. I sampled a little of the fake turkey, plain, just to get an idea of what we were working with. The texture was pretty turkey-lunchmeat-like, but the flavor had an off-note to it. 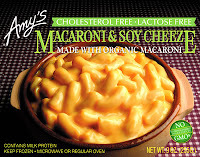 Probably that gluten-flavor that brings down so many other products' ratings, but fairly muted. But lunchmeats aren't meant to be eaten solo, so I stacked it up with some cheese on the cracker. 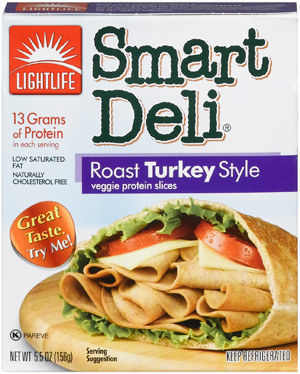 Eaten this way, any flavors the fake turkey may have had melted away into the strong flavors of Swiss cheese and salty whole wheat. This makes me wonder if maybe some of the flavored deli slices may do better. I played around with different fake-meat:cheese:cracker ratios, but the more fake meat I used, the more I could taste that not-awesome flavor. So, as a cheese and cracker accompaniment, I'd say it was that one group member who doesn't contribute anything but puts his name on the finished project anyway. How's that metaphor working for you? I wanted, as I said earlier, to try it out in a more standard sandwich situation, but that just didn't work out this time. I'd like to try some of the other varieties of Tofurky deli slices. Hopefully they'll have more of a presence when combined with other components. Flavor - Not much to say about it - not very tasty on its own, underwhelming when combined with other elements. 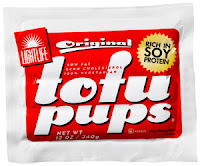 I mentioned in my first review of Lightlife's Tofu Pups that these hot dogs might perform better in a more traditional hot dog setting. 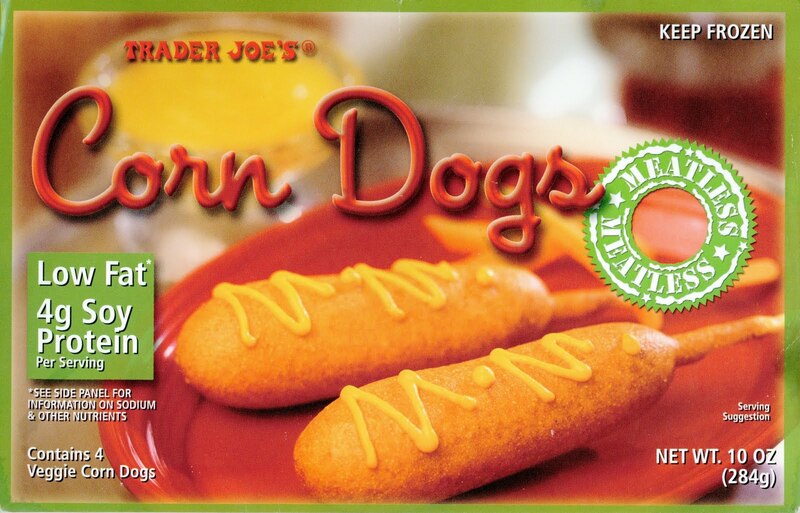 The other day, for lunch, I got ambitious and decided to transform my leftover Tofu Pups into corn dogs! Who doesn't like hot dogs wrapped in corn bread on a stick? I'm a little afraid of frying things at my house, since I don't have an actual deep fryer, so I went with the wimpier-yet-healthier route of a baked corn dog. I hunted around on the internet for a good recipe, and found one here that looked promising. I got the corn bread portion of the recipe ready to go, stuck the tofu pups on skewers (all I had at the time) and wrapped the corn bread dough around the dogs. They looked fairly edible, so I went ahead and baked them. The results: well, right away, the skewer was a failure. It pulled right out of the hot dog. I sort of knew it would, but hoped it maybe wouldn't. So I just picked it up with my hands and dipped it into the ketchup that way. It wasn't a big deal to do that, because, since it wasn't fried, it wasn't totally greasy. Disregarding the total dryness of the corn bread portion, the flavor of the corn bread melded very well with the flavor of the Tofu Pup. This is a very good application of this product. It still smelled terrible once you broke through the corn bread armor, but it tasted pretty okay all together. I would recommend (and may try for myself one day) a more standard batter and actually frying it. If you do this (or have done it in the past), let me know how it goes. As many of you may have noticed, it's summer. And what's a good thing to eat in the summer? Barbecue! 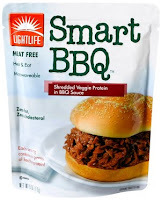 So this week, we're going to take a gander at Lightlife's Smart BBQ. Just to compare, I also tossed some pork shoulder into my slow cooker in the morning, but ended up choosing not to make this a head-to-head post, which I'll explain in a bit. I decided to flesh out the meal with some traditional sides: corn on the cob and coleslaw, with an awesome strawberry-rhubarb crumble for dessert. I was going to do this right! Once the real meat and the sides were just about ready, I put the package of Smart BBQ into the microwave, as directed. Right in the package and everything - just slightly tear the top to vent. Just a couple minutes later, everything was done! We loaded up our plates with both real meat and fake meat and got ready for some awesome barbecue. 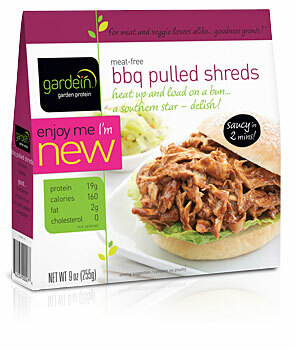 First thing I noticed - the fake meat barbecue did not have even remotely the same texture as the pulled pork I made. The pork was melt-in-your-mouth tender, while the fake meat was super chewy. I decided that the fake meat was not meant to imitate a pulled pork recipe, but maybe some beef brisket, which is much chewier. With that comparison in mind, I took another bite. I would go ahead and say it is pretty faithful to the chewiness of beef. As for the flavor, well, barbecue sauce covers most flaws, and this was no exception. The sauce was nicely tangy and and smoky, as promised. Unfortunately for the Smart BBQ, it was up against some very tough competition, so not too much of it got eaten, but the stuff that did was surprisingly good. Before typing up this review, I did some research on kielbasa, just to make sure I didn't say anything incorrect about polish sausages only to be told that there are different types and I am wrong and stupid. Turns out, there are different varieties of polish sausages (as I'd expected). With that in mind, I'll try not to make any sausage-ignorant comments about this Tofurky Kielbasa. First of all, the picture on the package is grossly misleading. They are bright red in the picture. The reality is that these are sort of grayish beige. 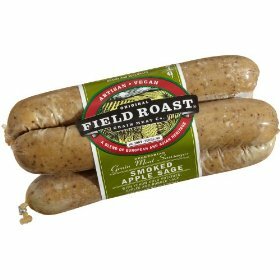 The picture had led me to expect a product I was pretty familiar with that I eat from time to time also called kielbasa (or polish sausage, or smoked sausage, depending on the brand that is cheapest at the time of purchase) that is more U-shaped and has a delightful spicy flavor. These were definitely not U-shaped, but that was okay, since I was really hoping they had the same flavor profile as the other sausage. Once I saw that they were gray instead of red, I lost some enthusiasm for the experience. The package said they were "outdoor grill approved" whatever that means, but I didn't feel like firing up my little mini charcoal grill just for these sausages, so I tossed them on my foreman grill. Same basic idea, I reasoned. When I get that U-shaped polish sausage, I like to eat it with some scalloped potatoes (although mashed is also good), so I whipped some of those up to go with these sausages, and some green beans, just to get a green vegetable in there. I grilled them up, but not for too long! Side note, I'm intrigued by the paradox of directions on so many products that strictly warn you DO NOT OVERCOOK but then give you a time frame that is WAY too long. This package's grill directions only say, "Sausages only take a short time to heat up on the grill," carefully avoiding this paradox, but providing very little helpful information. I was not terribly excited by the prospect of eating this sausage. It was still gray-beige, but now had grill marks. Still not the exciting bright red from the package. Anyway, I went ahead and tried it. It had sort of a peppery flavor, but not much else going on. The package claims the sausages have, "the perfect blend of fresh onion and garlic," but I would have to disagree. I tasted neither onion nor garlic. When combined with scalloped potatoes, whatever flavor was in there disappeared. It was just chewy potato flavor at that point, which was not terribly offensive, but not something I strive for in my meals. The texture was pretty nice, however. Not mushy or too dry or anything like that. I just wish it had had an equally nice flavor to go with it. Maybe, if I pick these up again, I'll try to cook it up in a soup or something, but the idea of enhancing a soup with the flavor of…not really anything…isn't terribly appealing.